Lenovo's 7-inch IdeaPad caught by Mr. Blurrycam? We spied a mystery FCC listing just the other day, filed under a no-name company but bearing some unmistakable Lenovo markings. 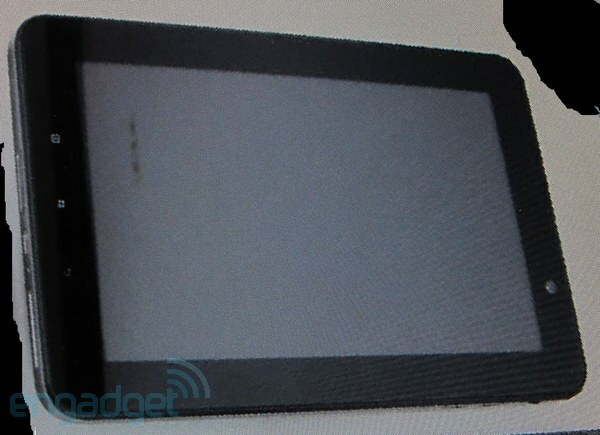 Now we have another unidentified device bearing the same branding and, according to our friendly neighborhood tipster, this is the company's 7-inch IdeaPad, which might be (internally) dubbed the A1-07. It's said to be powered by a TI OMAP3621 processor (which also drives the Nook Color), features a 7-inch 1024 x 600 touchscreen, a Broadcom GPS unit, 3G wireless with a SIM slot, and room for a microSD card as well. A 3,700mAh battery supposedly keeps things juiced, both front- and rear-facing cameras are on offer, and it's all wrapped in a glossy plastic styling that makes it look a little like a TouchPad with some bare metal highlights. It also features three buttons up front that we're hoping don't mean it's been relegated to Android 2.x. Now, the image above (and the second one, below) have obviously been crudely modified to hide something, and we can't be sure of what we're looking at here, but it's interesting enough for us to pass these along. Have a gander and let us know what you think in comments.